But I was pleasantly surprised to see this wee thing: I purchased Corydalis ‘Pink Splash’ in 2004 from Odyssey Bulbs. Last year I moved it to a sunnier location, and instead of being the last corydalis to bloom, it is the first. Either that, or I’ve lost more corydalis. I’ll keep you posted. 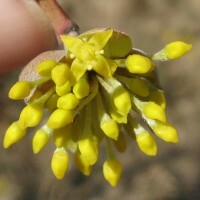 My ‘Spring Glow’ Cornelian cherry is in full bud.If you look carefully at the close-up, you can see the one flower that is actually open. This next photo was taken by my daughter Cadence. Do you recognize this dramatic flower? It is “just” a Siberian squill. One of the great blessings of modern digital cameras is they enable us to see the details of small flowers more easily than ever before. I don’t think I realized before this year that the anthers of these flowers were also an exquisite blue, or that the pedicel was an inky navy. 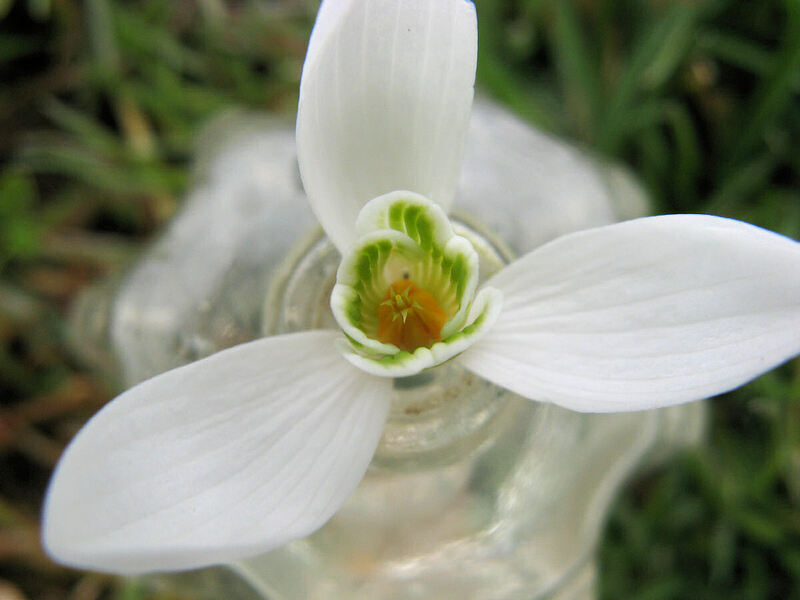 The snowdrops are past their prime, but I want to share one last photo with you, again by Cadence. 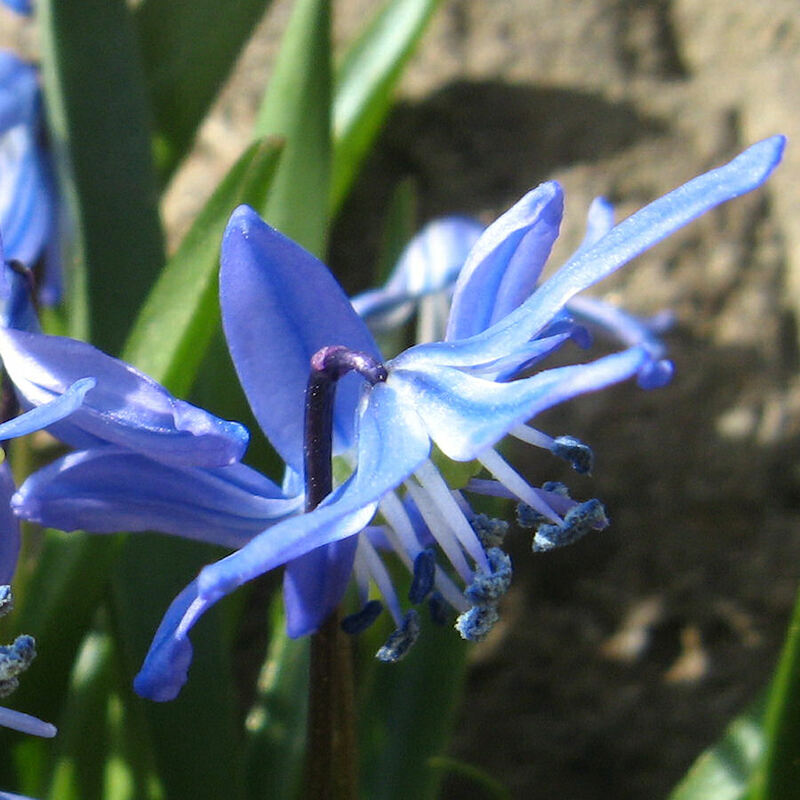 That Siberian squill looks really nice. What kind of upper temperature range can they handle. 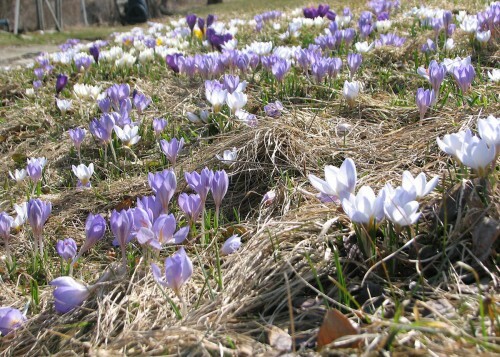 I love the photo of your crocus bank. It has some great natural sunlight and after the cold winter we have had it makes me think spring is just around the corner. The Siberian squill are just so beautyful and cadence picture is just amazing and she knows how to take a picture, i’ve try my hand at gardening for the first time this year and was shocked how realxing it really is, just got to keep my two young kids away because there worst than garden pest. .-= steve´s last blog ..What is the name of this post-apocalyptic novel? =-. Ted, I don’t remember the name of that crocus, but I listed all the varieties here. I hope by perusing the fall bulb catalogs you can attach a name to the one you fancy. Beautiful Crocus Collection! What a thrill that must have been! Digital photography is great fun. Happy Spring! Your Crocus bank is a stunner! I’m so glad Spring has finally made it to your garden. I agree with the other commenters that your daughter has real talent! OOPS! Happy Birthday Kathy! I’ve been busy with Hospice and getting ready to fly out and drive back from college with Son #2. 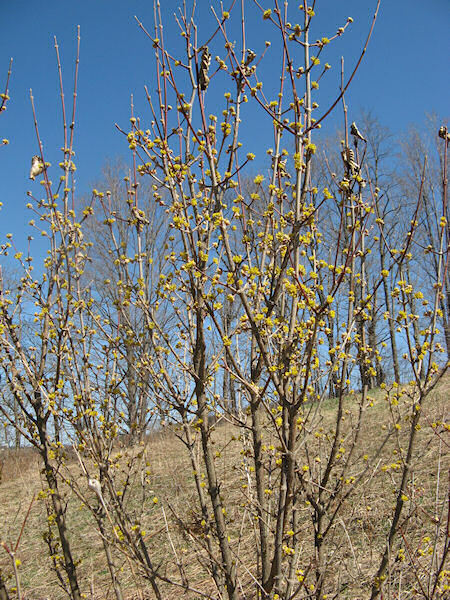 Things ARE starting to bloom in your neck of the woods! Yay, Kathy gets to share too! I must echo many of the other comments: Cadence’s photos are truly amazing. And so are yours, of course: such a beautiful sweep of crocus, and what gorgeous corydalis. 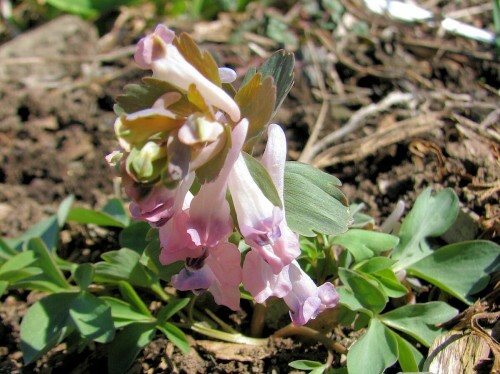 I hope your other corydalis are ok as well. Lovely presents for your 50th birthday, I’d say. The crocus are looking spectacular – I had a moment of nostalgia remembering the crocus banks in Ottawa. I have yet to see any here this year. You are so right about the little details which can go unnoticed. Cadence has an eye all right! Even the cold climates are warming up aren’t they. We have reason to celebrate this month’s GBBD Kathy! Finally…an assortment of outdoor blooms! I love you crocus bank. How lovely! The cornus mas is beautiful, and how lucky you are to have that pretty corydalis. My daffs are just beginning to open too. Your daughter’s photo of the scilla is amazing. Makes me want to go out with my camera and try that. Beautiful detail! Looks like I’ll have to plant a new hellebore. Mine looks like it didn’t make it, but I haven’t quite given up hope yet. Those crocuses are lovely. How wonderful it must be to have a whole bank of them like that. Wonderful photos, Kathy, and your daughter did a stellar job on photography. Warmest congrats and best wishes on your Mousie nominations, too. Even the pollen is blue! Gorgeous photos. Thanks! You have a nice crocus bank. I have to get me one next year. Actually, I decided I needed one after the crocus field image at The Occasional Gardener (hope you don’t mind the link). Since it’s crocus season here, I guess I’m drawn to them in other gardens too. You have a staff photographer, it seems. She did a lovely job—beautiful photos. Tell Cadence she’s got talent- you might have to start outsourcing your garden photography to her! I love the crocus bank. What a lovely shot. I’m happy because I don’t feel too far behind here in WI. We’re in the midst of crocus and squill. 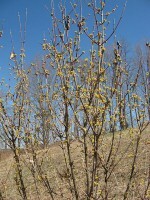 I didn’t check my Cornus mas today, but I know it’s not that far. Kathy, do you know what the lavender crocus is doing so well in the photo? Your photos are so lovely…it is amazing to see the details those closeups can show. It’s good to see flowers on your page, Kathy, instead of snow – and it’s also good to know your daughter has that ability to see into the heart of things, just like her mom. Digital cameras came too late for me to look at plants from my old northern gardens this way – I loved my flowers but wish I could have seen them like this! Knowing about the Inky navy pedicel is also a gift. Congratulations on the Mousie nomination for best design! Beautiful. I love the little blooms and the close ups with all the details!